Baby Plum is becoming a very picky eater. I'm not sure he can exist on fruit and peanut butter alone. But sometimes he likes to pretend to eat a wider variety of foods. We went to a Chipotle restaurant while in the "big city" over the weekend. Baby Plum pretended to eat Little Elvis' rice. He thought he was hilarious, as did our dinner guests. I'm sure the people who had to clean up our mess did not think it was so funny. After noshing on only applesauce at my parents' house, my mom gave Baby Plum a piece of chocolate. He shoved the whole thing in his mouth and when he smiled, chocolate oozed out. See the new knot on his noggin? He fell off our bed and hit my nightstand. It's pretty much the same spot where he hit his head last month. Little Elvis has been counting down the days to Cars 2 for several weeks now. Added to his excitement was his chance to go see the movie in another town -- one with a Target. Yes, our child loves Target. My mom's friend rented out a theatre in the "big city" to do a screening, and we got to go watch the movie in the bright lights of the bigger locale! Little Elvis got to pose with Lightning McQueen on the big morning. He also got a cool t-shirt, and played hide-and-seek with the Good Neighbear. While Little Elvis liked Mater in the new movie, Finn McMissile is now the coolest car ever. After the movie, we went back to my mom's friend's office to drop off some supplies. And to get Baby Plum to pose with a stuffed Good Neighbear. Little Elvis attempted to snarl with the real Elvis. We all had so much fun! The movie was fun, and completely different from the first Cars. I guess it was more violent, but Little Elvis didn't seem to pick up on it. Baby Plum handled his first movie experience very well. He slept for the first hour, drank a whole lot of fruit punch for the second half, and started humming right at the end. It was a quiet hum, but Bob and I enjoyed it. And Little Elvis spent all of his dollars at Target. We once again realized the futility of explaining bargain-hunting to our Pixar-loving child. He had money, and he wanted Cars 2 cars. Little Elvis has discovered onion rings. I think they top french fries on his list of favorite foods. My parents took him to Hardee's the other day after he helped them pick and shuck corn. Baby Plum had strep throat the other day. 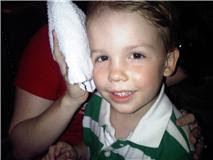 He didn't act like he hurt, but his fever was pretty high. Here he is enjoying a fruit leather while we wait for the result of the strep test. He was too fast for me to get a shot of his cute face, so instead I got his pretty curls. Baby Plum bawled and bawled, and I was so mad. He loves his daddy, and has no desire to have anything to do with me if Bob is near. But I was the only one in the room, so I had to be the one that held him for the shot. Bob got to be the hero when we finally got back to the waiting room, because it took me several minutes to calm most of the screams. The second he was in his daddy's arms, he quieted to snuffles. How cute are they? Little Elvis was watching a video we rented at the library, and Baby Plum just had to sit beside him. Baby Plum is getting to be a pretty big fan of his older brother. Whenever Little Elvis is in timeout (at least 1-2 times a day,) Baby Plum will stand on the outside of the door, crying and trying to get in. Little Elvis will be on the other side crying, and trying to get out. It's fun. And usually Little Elvis is in time-out for something he did to Baby Plum. I'm still glad they're pals. At least for right now. It's been a rough week around our household -- at least for the littles. Last Thursday night Little Elvis started running a fever (of course, it always happens when the doctor's office is closed.) It got up to 103 around midnight, and I had him an appointment for 10:30 Friday morning. He woke up on Friday with no fever and feeling fine. I pushed his appointment back to the afternoon, and watched as he played and had a blast all morning. By the time we got to the doctor's office, he had a slight fever. By the time the doctor got into our room he was rubbing his left ear. Poor guy had an ear infection. He must have a pretty decent threshold for ear pain. He was feeling much better by Sunday, and we were hanging out at my parents' house. My wild child tripped while running over pillows and fell headfirst into a wooden rocking chair. Though he was screaming bloody murder, he found the strength to smile at the camera. Don't worry, he didn't bruise. So the cries were probably more from being scared. As for Baby Plum, he started running a fever after supper (of course...) and he was rubbing his ear when I put him in his crib. Guess I'll call the doctor first thing tomorrow morning. Despite all of the fears, we constantly heard from others that we shouldn't worry -- he would start talking and wouldn't stop. Those people were right. Once he started, he really didn't stop. 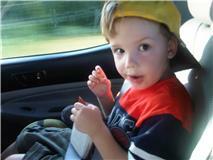 This child can chatter through an hour and a half car trip. Onto his younger brother -- who isn't saying much at 20 months. We've been trying to encourage more words, but he's not into it yet. His pediatrician scheduled a 21-month check-up to check on his speech, and it's in just a couple of weeks. Since his brother didn't really take off until 22 months, we hadn't been worrying. And Baby Plum amazes us with what he understands. He follows commands better than his brother. Still, we've been pushing 'banana' and 'book' on him this week. 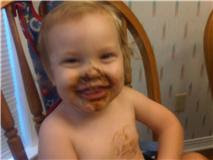 Baby Plum may like many foods, but chocolate has to be his favorite! Thankfully, he never manages to get very much into his mouth. We're working on sharing around here. Some days it goes well, others not so much. Yesterday, there was a sweet, sweet moment. Unfortunately, I didn't catch it very well. I gave Baby Plum a small cup of Cheerios as a snack. He took the bowl to Little Elvis, then sat down by his brother. Little Elvis would eat a Cheerio, then feed one to his expectant little brother. It was cute! Little Elvis, eating the Cheerios. I'm not sure. Most likely Baby Plum has a Cheerio in his mouth. It looks like they were showing me how similar their hair color is, though. Trust me, at this point, they only have looks in common. Their personalities are pretty different. Is it possible for a fearful to child to suddenly become fearless? Does the transition from 3-year-old pre-schooler to 4-year-old little boy include some sort of braveness inducing chemical shift? Little Elvis wasn't exactly fearful, but he was definitely scared of heights and going too fast. He didn't want to spend the night with his grandparents, because he needed to protect his mommy. Now he begs to spend the night with Gram and Coachpa, and would probably spend the night with other family members if invited. He spent his first full weekend away from us, and had absolutely no problems. I called and fretted, but he didn't miss me nearly as much as I missed him. And he will not stop jumping off of the furniture! Or jumping from furniture piece to furniture piece! Baby Plum loves following his big brother around, but thankfully hasn't started jumping off of things... yet. Little Elvis often tells me that he jumped into a big boy, and he's so right. It happened overnight. When did our baby become so big?